Read the review of Part One here, Part Two here, and Part Three here. Every boy needs a rival. Not necessarily an enemy, but a rival. Someone to do battle with mentally, emotionally, spiritually, and even at times physically. This is just a simple fact of boyhood. Usually those rivals are found in the family. They are the other boys. Brothers. Brothers can fight like cats and dogs and yet if someone from the outside looks in and tries to pick a fight suddenly those two rivals join ranks and the antagonist finds himself having gotten a two-for-one special. At other times, boys find rivals outside the family, be it at school, at church, at camp, or other places that boys have been known to congregate as they plot their next adventure in the wide world around them. Usually, these outsiders become more than mere rivals, they become friends. Friends that at times may stick closer than a brother through this process of iron sharpening iron (Proverbs 27:17). All of the great adventure stories provide boys with heroes, mentors, teachers, and faithful companions. Older men, wise men learn to look for those young men who need direction and molding, but no one can affect a boy like another boy who serves to rival him in a pursuit. I met a young boy one day at a Bible conference. He was only 12 or 13 at the time. He was short, wearing big round wire frame glasses, dressed in a blue suit and wearing a sharp tie. And this young boy was able to walk into the middle of a circle of my friends, all at least 5 years older than he was, and challenge us all to argue some of the finer theological points of Scripture using some terms those of us about to head off to Bible college had never heard. Who was this young whipper snapper, we knowledgeable and wise 17 and 18 years olds asked? And where did he get off acting like Jesus in the Temple at 12 years of age trying to teach the teachers? Yes, we had a high view of ourselves. And Jason Hedges was not intimidating to look at until he started talking! But then this young boy did something that changed my life. He introduced me to his older brother. Younger than I was by a couple of years, which matters more when you are young than when you are old, his brother immediately proved that teenagers can debate the Scriptures as deeply and passionately as the Puritans of old. Suddenly I was neck deep in a debate about some heavy theological topics. And I was losing ground quickly. I had been a debate champion in high school. I had captained the winning Bible Trivia team at church camp twice. I was supposed to know this stuff! And yet I was bested by this articulate teen from a place in the middle of nowhere called Tokio, Texas (listed as a ghost town). Yes, when Brian Hedges and I met as teenagers, we started our friendship off as rivals by arguing the Scriptures. He the son of a pastor, me having been preaching since I was 14 preparing the month after I met him to start Bible college, and back in those days (actually not so very long ago) we wrote letters back and forth. Pages and pages (still packed away in a box in a back room here at my house) sent by snail mail making points and counterpoints about the Scripture, the nature of salvation, the truth about the church, the family, revival, discipleship, and theology. I began the next year spending every spring break all through college with Brian and his family. They became a second family to me in many ways. His father Ronnie married my wife and I. His mother Gloria gave Renee her recipe for Buttermilk Pie, my favorite. They discipled us and modeled for us godly family living day in and day out. His godly grandparents served as a deacon and deacon’s wife at the church I served for my first full time pastorate. And Brian and I passed the time discussing Scripture, praying, playing golf, and in a special rivalry we played two games – Scrabble and Chess. I was, at the time, better with words than he and never lost, that I can remember or will admit, a game of Scrabble to Brian. But I also never beat him, not once in my life, at Chess. His logic was near infallible, at least in my eyes. That, or my logic was really poor. Whatever the case, we sharpened each other as iron sharpens iron, and out of that friendship forged in our teenage years around the Word of God, though neither of us is 40 years old quite yet, we now have a combined experience of over 40 years of ministry as ministers of the gospel of our Lord and Savior Jesus Christ. I was there at Brian’s cold winter baptism. I saw him go off to join Life Action Ministries. Then he was called to pastor the church my great uncle had planted in Lawn, Texas, generations ago. Brian became adept at writing book reviews, something that I have rarely done. And now, married with 3 kids and serving as the lead pastor of Fulkerson Park Baptist Church in Niles, Michigan, Brian has finally written a book of his own! I have been waiting for this day because I know that Brian is thorough, I know that he is articulate and is much better with words now than he used to be! And I know that God has sent him mentors to disciple him who have been used by God to mold him into a godly young preacher with experience and knowledge beyond his years. Brian has become one of the most thoroughly theological and at the same time practical preachers that I know today. And now I get to write a book review! As I have spent time the last few weeks reading and re-reading Brian’s book Christ Formed in You: The Power of the Gospel for Personal Change (Shepherd Press 2010), I see now that he has spent years soaking up all the good theology he can find, from the Puritans and our theological forefathers to the leading minds and preachers of our day. I am going to publish my review in 3 parts (plus this introduction) since Brian wrote it in 3 parts. I look forward to spending a little time with you this week reviewing the next book we will be adding to our book table at church. Yes, it is that important a book. From presenting the gospel clearly and thoroughly, to giving practical steps to living a successful Christian life, to answering questions that many today are asking in the church, this book will be a resource for generations to come. I hope to show through the course of this review that I am not just saying that because Brian is my friend and fellow worker in the Kingdom of God. I say that because this is a book that you need to read, a book that covers so much of the truth and depth of Scripture that the evangelical church today is missing. And he does so in a simple (not simplistic) way that allows the reader to see that there are little things he or she can do that will make a big difference in their daily walk for their good and the glory of God. His approach is richly doctrinal but not dry because while he writes with the mind of a theologian he has the heart of a pastor. 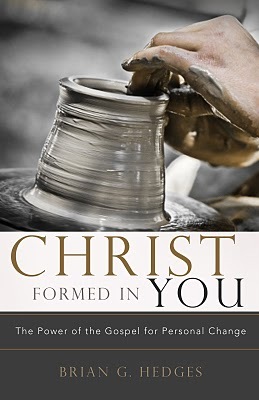 So join me tomorrow for part 1 of my review of Christ Formed in You: The Power of the Gospel for Personal Change by By Pastor Brian G. Hedges. I’ll see you then. (Order Your Copy Today and get special pre-release pricing).